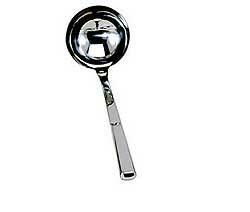 Update International deep ladle features 18/0, 2.2 mm thick stainless steel, with a hollow handle. Dimensions are: 3-1/2 oz., 12-1/4". Great for buffet line or punch bowl. 18/0, 2.2 mm thick stainless steel.